Organized by Emory students, the third annual American Mock World Health Organization conference will bring nearly 200 college students from as far away as Afghanistan to campus this weekend to take up one of the world’s greatest health threats: antimicrobial resistance. Photo by Charlie Harless of Cultura es Vida Photography. At the invitation of a handful of Emory undergraduates, nearly 200 college students from as far away as Afghanistan will visit campus this weekend to take up one of the world’s greatest health threats. The third annual American Mock World Health Organization conference, which runs Friday through Sunday, will see those students act as members of the United Nations’ public health body in a bid to think differently about antimicrobial resistance. Experts routinely cite the superbugs that can beat back medications as a growing concern. “What I am particularly interested in is how we can bridge the critical gap between practitioners and receivers of care, to show how proper use of antibiotics in AMR-dense countries can slow their spread,” adds Das, who is majoring in chemistry and neuroscience and behavioral biology (NBB). The goal of the group is to help students focus on international public health issues, much the same way that the more familiar Model UN educates on diplomacy and public policy. That Emory is a proving ground for such education has as much to do with chance as the University's reputation for health sciences. Das grew up in the same Georgia town, Warner Robins, as Neha Acharya, who founded the mock WHO as an undergraduate in 2014 at the University of North Carolina. The two reconnected two years ago when Acharya decided to pursue her master of public health from the Rollins School for Public Health. Das and Mansi Maini, a junior NBB major, then decided to charter the Emory chapter. The group co-hosted a Georgia Regional Conference last year, which brought high school students into the discussion. Das also attended last year’s conference, held at UNC. There, like the conference this weekend, he and other students acted as delegates from 194 countries as though they were meeting for the annual World Health Assembly in Switzerland. "It's about simulating a global health structure that is difficult to teach in a classroom setting,” Acharya says. “Having this year's conference at a well-rounded school like Emory provides students of all academic backgrounds the opportunity to learn the critical tools of global health diplomacy." 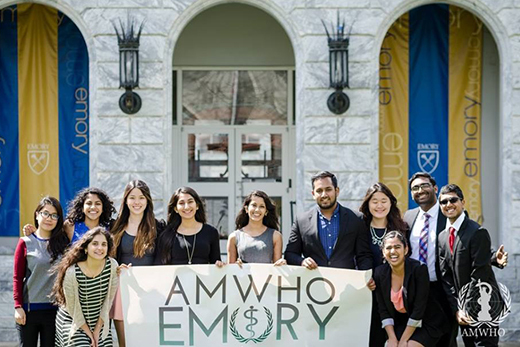 Having antimicrobial resistance as this year’s theme is also a good fit for Emory. Ethnobotanist Cassandra Quave, a faculty member in Emory’s Center for the Study of Human Health, is a leader in the race to find the next generation of antibiotics. The campus also houses the Emory Antibiotic Resistance Center, which confronts antibiotic resistance in novel and interdisciplinary ways. The center is a key sponsor of the event, having helped the mock WHO find speakers. Center director and infectious disease professor David Weiss will serve as an opening speaker. Weiss was impressed by the work done by the students. Benjamin Mason Meier, associate professor of global health policy at the University of North Carolina – Chapel Hill, whose interdisciplinary research — at the intersection of international law, public policy and global health — examines human rights frameworks for global health governance. Das says the students will split into five groups Saturday, representing the regional blocs of the WHO. There they will negotiate resolutions on different aspects of the issue. Only resolutions that pass the final plenary assembly on Sunday will become products of the conference. They then will submit the final resolutions to the very real WHO, for review and comment. “The implications [of the mock exercise] are as real as this threat,” Das says.